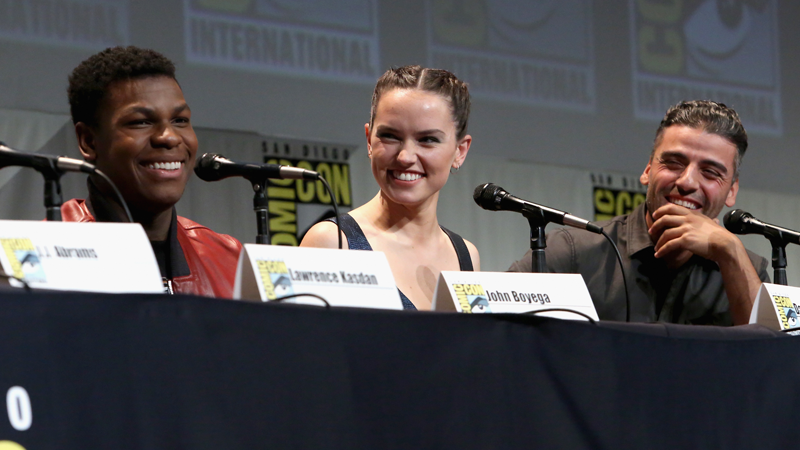 John Boyega, Daisy Ridley, and Oscar Isaac at San Diego Comic-Con 2015's Star Wars panel. Credit: Jesse Grant / Stringer/Getty Images. When San Diego Comic-Con announced a streaming video service, few were optimistic that it would allow fans to see the best panels that take place every year. Surprise! They will be streaming—but not without some major caveats. In a new interview with /Film, General Manager of the Comic-Con HQ app Seth Laderman confirmed what fans have been hoping for: Hall H’s panels, where you hear biggest announcements of the show, will be streaming in the app. There’s is a major drawback though: The panels won’t be streamed live. The short answer is yes. We’re going to be working with every single studio, every single panel host to be able to take the content and put it on our platform. We’re not going to be live streaming anything because we really don’t want to take away that experience of people who are the first to see and be there for it, but we can put things up shortly after. This makes sense—if you could stream the whole thing live, standing in line (and paying money for tickets and hotels) starts to feel like a waste. As long as people get eventual access to the elusive footage shown at those panels, we’re good. Unfortunately, one of the options currently in play to get studios on board with streaming is to remove that footage from the archived broadcasts. That is one of the options as well and we’re going to be working with all the studios and the panel hosts to figure out what would be the best way to handle that, because a lot of these studios have their marketing plans and how they want to control their assets. We’re really just here as a conduit to be able to help promote everyone, similar to what Comic-Con is, so whatever’s best for them will be good for us. As disappointing as those revelations might be, the fact that this service will stream during the Con is a huge step in the right direction for supporting the thousands of people who are unable to attend. One day you’ll be able to experience all the delights and madness of SDCC from the comfort of your home. Comic-Con HQ’s free beta is set to go live with a host of original programming and archival footage on Free Comic Book Day, May 7th. Details on how much the subscription service will cost have yet to be revealed.